Impaired angiogenesis is a hallmark of metabolically dysfunctional adipose tissue in obesity. However, the underlying mechanisms restricting angiogenesis within this context remain ill-defined. 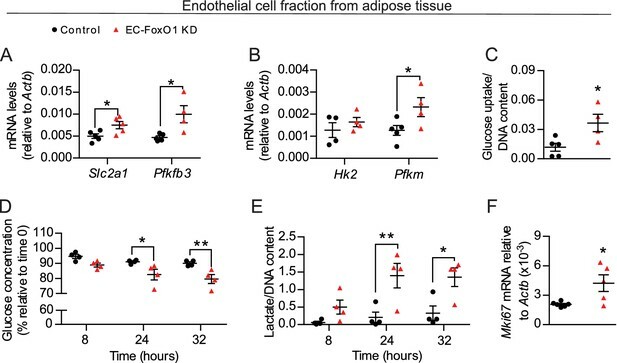 Here, we demonstrate that induced endothelial-specific depletion of the transcription factor Forkhead Box O1 (FoxO1) in male mice led to increased vascular density in adipose tissue. Upon high-fat diet feeding, endothelial cell FoxO1-deficient mice exhibited even greater vascular remodeling in the visceral adipose depot, which was paralleled with a healthier adipose tissue expansion, higher glucose tolerance and lower fasting glycemia concomitant with enhanced lactate levels. 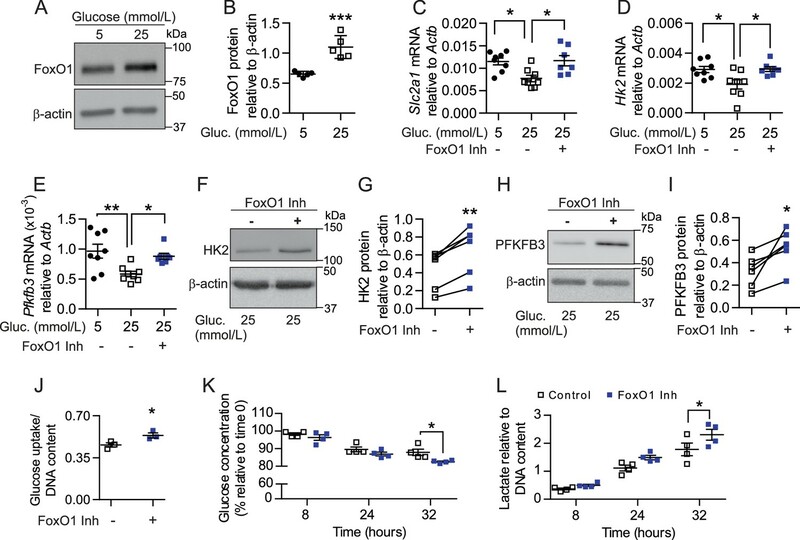 Mechanistically, FoxO1 depletion increased endothelial proliferative and glycolytic capacities by upregulating the expression of glycolytic markers, which may account for the improvements at the tissue level ultimately impacting whole-body glucose metabolism. Altogether, these findings reveal the pivotal role of FoxO1 in controlling endothelial metabolic and angiogenic adaptations in response to high-fat diet and a contribution of the endothelium to whole-body energy homeostasis. In the body, thread-like blood vessels called capillaries weave their way through our tissues to deliver oxygen and nutrients to every cell. When a tissue becomes bigger, existing vessels remodel to create new capillaries that can reach far away cells. However, in obesity, this process does not happen the way it should: when fat tissues expand, new blood vessels do not always grow to match. The starved fat cells can start to dysfunction, which causes a range of issues, from inflammation and scarring of the tissues to problems with how the body processes sugar and even diabetes. Yet, it is still unclear why exactly new capillaries fail to form in obesity. What we know is that a protein called FoxO (short for Forkhead box O) is present in the cells that line the inside of blood vessels, and that it can stop the development of new capillaries. FoxO controls how cells spend their energy, and it can force them to go into a resting state. During obesity, the levels of FoxO actually increase in capillary cells. Therefore, it may be possible that FoxO prevents new blood vessels from growing in the fat tissues of obese individuals. To find out, Rudnicki et al. created mice that lack the FoxO protein in the cells lining the capillaries, and then fed the animals a high-fat diet. These mutant mice had more blood vessels in their fat tissue, and their fat cells looked healthier. They also stored less fat than normal mice on the same diet, and their blood sugar levels were normal. This was because the FoxO-deprived cells inside capillaries were burning more energy, which they may have obtained by pulling sugar from the blood. These results show that targeting the cells that line capillaries helps new blood vessels to grow, and that this could mitigate the health problems that arise with obesity, such as high levels of sugar (diabetes) and fat in the blood. However, more work is needed to confirm that the same cellular processes can be targeted to obtain positive health outcomes in humans. Obesity is a growing problem worldwide (Moller and Kaufman, 2005; Tchernof and Després, 2013) and thus an urgent need exists to identify molecular processes and signaling pathways that may serve as novel therapeutic targets to hinder obesity-induced pathologies. Although the underlying causes of obesity-related complications are multifactorial, the dysfunction of adipose tissue plays a central role in the development of peripheral tissue metabolic disturbances, ultimately reflecting systemically in dyslipidemia, insulin resistance and hyperglycemia (Moller and Kaufman, 2005; Fuster et al., 2016). Capillary endothelial cells (EC) are well-known regulators of tissue adaptation to pathologic challenges through their prominent role in blood vessel formation and remodeling. During expansion of visceral adipose tissue, impaired vascular remodeling promotes hypoxia, inflammation, and fibrosis (Corvera and Gealekman, 2014; Fuster et al., 2016). Conversely, forced stimulation of vascular growth in adipose tissue of obese rodents improves adipose tissue function (Sun et al., 2012; Robciuc et al., 2016; Seki et al., 2018), counteracting obesity-related metabolic disorders (Sung et al., 2013; Seki et al., 2018). These findings indicate that the remodeling capacity of microvascular ECs during obesity is vital not only for the adipose tissue function but also for the development of systemic metabolic disturbances. However, surprisingly little is understood about the signaling pathways that limit the angiogenic response of EC in obesity. Forkhead Box O1 (FoxO1) signaling is essential to the homeostasis of EC and restricts vascular growth (Wilhelm et al., 2016). In addition to the control of angiogenesis-related genes (Potente et al., 2005; Paik et al., 2007; Milkiewicz et al., 2011; Roudier et al., 2013; Wilhelm et al., 2016), FoxO1 is a gatekeeper of EC metabolism; its overexpression reduces the metabolic rate of EC and enforces a state of endothelial quiescence (Wilhelm et al., 2016). Thus, this transcription factor is one of the major regulators of angiogenic capacity, since the switch from a quiescent to an angiogenic phenotype requires a coordinated increase in EC metabolic activity to meet the higher demand for energy and biomass production associated with proliferation and migration (De Bock et al., 2013; Schoors et al., 2015; Kim et al., 2017). Compelling observational evidence indicates that endothelial FoxO1 dysregulation coincides with obesity-associated metabolic disturbances. For instance, FoxO1 protein levels were elevated in capillaries from skeletal muscle of mice fed a high-fat diet (Nwadozi et al., 2016) and the activity of endothelial FoxO1 correlated with adipose insulin resistance of obese subjects (Karki et al., 2015). Additionally, in vitro conditions that mimic hyperglycemia and insulin resistance increase FoxO1 protein and activity in EC (Tanaka et al., 2009; Nwadozi et al., 2016). Nevertheless, to our knowledge, the contribution of FoxO1 signaling to vascular remodeling during obesity has not been addressed experimentally. To date, only a few reports have assessed the relevance of endothelial FoxO proteins in diet-induced disorders, but none have examined the influence on adipose tissue. Moreover, those studies employed simultaneous EC-specific depletion of multiple FoxOs (FoxO1, FoxO3, and FoxO4) and transgenic lines in which gene targeting was not exclusive to EC (Tanaka et al., 2009; Tsuchiya et al., 2012; Nwadozi et al., 2016), preventing discrimination of the specific functions of endothelial FoxO1. Notably, it has been shown that in vitro conditions associated with FoxO1 dysregulation can also compromise EC metabolism (Zhang et al., 2000; Du et al., 2003; Jais et al., 2016). Although this suggests that the interplay between endothelial FoxO1 levels and EC metabolic activity may be critically implicated in limiting vascular remodeling in obesity, this concept demands validation. The converging roles of FoxO1 in the angiogenic phenotype and the metabolism of quiescent EC led us to hypothesize that FoxO1 is a critical nodal point in determining the response of capillary EC to obesity. Consequently, we postulated that targeted endothelial-specific depletion of FoxO1 would provoke capillary growth, preventing obesity-driven adipose tissue dysfunction, and provide a valuable tool to unmask the role of the microvascular endothelium metabolism in the pathophysiology of obesity. To assess the involvement of EC-FoxO1 in the control of vascular growth in the adipose tissue of adult mice, we utilized a mouse model of EC-selective depletion of FoxO1 expression (referred to ‘EC-FoxO1 KD’ mice hereafter) through inactivation of the Foxo1 gene specifically in EC. Foxo1 floxed (Foxo1f/f) mice were crossbred with Pdgfb-iCreERT2 mice that express tamoxifen-activated Cre recombinase in EC and Cre-mediated recombination of Foxo1 was induced in adult mice. Littermate mice homozygous for the floxed Foxo1 allele but not expressing Cre recombinase were used as controls. After tamoxifen injection, Foxo1 recombination was observed within adipose and skeletal muscle but not within the liver, as endothelial Pdgfb expression is undetectable in this organ (Hellström et al., 1999). The endothelial cell specificity of the recombinase activity was confirmed in microvascular EC isolated from adipose tissue (Figure 1A). Consequently, Foxo1 transcript level, as measured by qPCR, was decreased by 50% in microvascular EC of EC-FoxO1 KD mice relative to control littermates 8 weeks after the administration of tamoxifen, confirming effective and stable Foxo1 depletion in these cells (Figure 1B). Of note, Foxo3 mRNA expression was unaltered in microvascular EC (Figure 1B), demonstrating a lack of compensation by this FoxO family member in response to the depletion of Foxo1. Moreover, consistent with the previously described absence of Pdgfb-Cre activity within macrophages (Claxton et al., 2008), no significant changes in Foxo1 mRNA levels were detected in CD16/CD32+ immune cells from white adipose tissue (Figure 1C), indicating that Cre-mediated recombination did not occur in these stromal cells. The depletion of EC-Foxo1 in microvascular beds of EC-FoxO1 KD mice also was validated via assessment of FoxO1 protein levels by Western blotting. In agreement with the lower mRNA levels observed in microvascular ECs from adipose tissue, protein levels of FoxO1 were diminished by 70% in capillary fragments from skeletal muscle of EC-FoxO1 KD mice compared to control littermates 6 weeks after the administration of tamoxifen (Figure 1D). Together, these results not only imply that successful Foxo1 depletion was constrained to the endothelial cell compartment, particularly microvascular beds, but also support the use of EC-FoxO1 KD mice as an appropriate model to assess the relevance of endothelial FoxO1 for vascular remodeling during adipose tissue expansion. Endothelial-specific depletion of Foxo1 induced in adult male mice effectively reduces FoxO1 levels in skeletal muscle and adipose microvascular beds. (A) PCR of genomic DNA from multiple organs of control (Cre-; Foxo1f/f) and EC-FoxO1 KD mice using primers for the floxed and deleted (E1∆E3) alleles. (B–C) Gene expression analysis of microvascular EC and CD16/CD32+ cells isolated from white adipose tissue of Control (n = 6) and EC-FoxO1 KD (n = 3–5) mice. (D) Representative Western blot images and quantitative analysis of FoxO1 and β-actin levels in capillary fragments isolated from skeletal muscle (n = 3–4). Results are expressed relative to β-actin levels. Data in all panels are expressed as mean ± SEM; *p < 0.05, **p < 0.01, calculated with two-tailed unpaired t-test. EC-FoxO1 KD mice maintained on a normal chow (NC) diet for 16 weeks exhibited no gross abnormalities and similar body weight gain compared to control counterparts (8.32 ± 1.3 vs. 7.75 ± 1.17 g, n = 6/group), but significantly increased mRNA levels of the EC marker Pecam1 in eWAT (Figure 2A). When blood vessels were visualized by whole-mount staining with G. simplicifolia lectin, it was evident that the vascular density of visceral adipose tissue from EC-FoxO1 KD mice (Figure 2B–C) was significantly higher. EC-FoxO1 depletion did not alter the number of vessel branch points (Figure 2D). On the other hand, vessels in the adipose of EC-FoxO1 KD mice were significantly enlarged, showing increased vessel diameter, compared to control littermates (Figure 2E), which was consistent with the reported influence of EC-Foxo1 depletion in vascular development in retinas (Wilhelm et al., 2016). No difference in the expression of Pecam1 was detected in other assessed tissues, such as skeletal muscle and liver (Figure 2A). Greater vascular density in visceral adipose tissue of normal chow-fed EC-FoxO1 KD mice. (A) Pecam1 mRNA levels in various tissues of Control and EC-FoxO1 KD mice after 16 weeks of normal chow (NC) diet (Control n = 6, EC-FoxO1 KD n = 5). (B) Representative confocal images of adipose tissue whole-mount staining with BODIPY 493/503 (green) and G. simplicifolia lectin (red) (×20 magnification; scale bar = 100 μm). (C–E) Lectin area (C), capillary branch density (D) and microvessel diameters (E) were quantified from confocal images (Control n = 5, EC-FoxO1 KD n = 6). Data in all panels are expressed as mean ± SEM; *p < 0.05, **p < 0.01, calculated with two-tailed unpaired t-test. To determine whether EC-FoxO1 depletion evokes vascular growth during adipose expansion in response to excess caloric consumption, we challenged mice with a prolonged high-fat diet (HF) and assessed tissue angiogenesis. Gene expression analysis indicated that EC-FoxO1 depletion resulted in higher Pecam1 mRNA levels in multiple adipose tissue depots: eWAT, subcutaneous and brown adipose tissue (BAT, Figure 3A). In line therewith, transcript levels of other EC markers, von Willebrand factor (Vwf) and endothelial nitric oxide synthase (Nos3) were elevated in the eWAT of HF-fed EC-FoxO1 KD mice (Figure 3B). 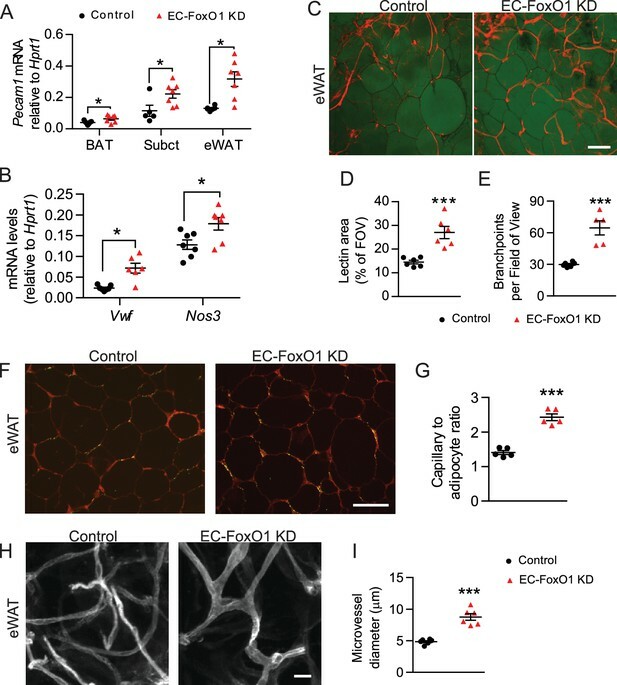 Whole-mount staining of adipose tissue revealed remarkable increases in vascular area and number of vessel branch points in the eWAT of HF-fed EC-FoxO1 KD (Figure 3C–E). Consistently, quantitative histological analysis showed that capillary number per adipocyte (capillary to adipocyte ratio) was significantly higher in eWAT of HF-fed EC-FoxO1 KD mice, further validating the greater microvascular content in eWAT of these mice compared to HF-fed control counterparts (Figure 3F–G). Furthermore, EC-FoxO1 depletion led to significant capillary enlargement in eWAT (Figure 3H–I). Of note, the increase of vessel diameter in HF-fed EC-FoxO1 KD mice was greater than observed in NC-fed EC-FoxO1 KD mice (1.8 vs. 1.3-fold increase), suggesting that the enlargement of capillaries promoted by EC-FoxO1 depletion is exacerbated by HF feeding. EC-Foxo1 depletion strongly induces vascular growth within adipose tissue in response to HF diet. (A) Pecam1 mRNA levels in different adipose tissue depots of Control and EC-FoxO1 KD mice after 16 weeks of high-fat (HF) diet (Control n = 5–7, EC-FoxO1 KD n = 7). (B) Gene expression analysis of eWAT of HF-fed Control and EC-FoxO1 KD mice (Control n = 7, EC-FoxO1 KD n = 6–7). (C) Representative confocal images of adipose tissue whole-mount staining with BODIPY 493/503 (green) and G. simplicifolia lectin (red) (C - scale bar = 100 μm). (D,E and I). Lectin area (D) and capillary branch density were quantified from these images (Control, n = 6; EC-FoxO1 KD, n = 5 or 6). (F–G) G. simplicifolia lectin (green) and Wheat germ aggluttinin (red) staining of paraffin-sectioned adipose tissue (F - scale bar = 100 μm) was used to assess capillary to adipocyte ratio (G). (H) Representative confocal images of adipose tissue whole-mount staining with Isolectin alone (greyscale; scale bar = 20 μm). (I) Microvessel diameters were quantified from confocal images (Control, n = 6; EC-FoxO1 KD, n = 6). Data in all panels are expressed as mean ± SEM; *p < 0.05, ***p < 0.001, calculated with two-tailed unpaired t-test. Subsequent gene expression analysis showed that EC-FoxO1 depletion did not change transcript levels of Pecam1 in the liver (corresponding with the lack of Cre recombination in this organ) but did upregulate its expression in skeletal muscle, suggesting that under the stimulus of HF diet, EC-FoxO1 depletion also induces microvascular remodeling in this tissue (Figure 4A). Skeletal muscle of HF-fed EC-FoxO1 KD mice displayed a trend towards higher capillary:fiber ratio (p = 0.06) compared to control mice (Figure 4B–C). Transmission electron microscopy revealed increased capillary endothelial cross-sectional area and capillary lumen diameters in skeletal muscle of EC-FoxO1 KD mice, demonstrating a modest expansion of the size of individual capillaries (Figure 4D–F). Taken together, these data indicate that EC-FoxO1 depletion results in remarkable vascular growth in response to HF diet, which is particularly pronounced within visceral adipose tissue. EC-Foxo1 depletion also favors microvascular expansion in skeletal muscle under HF diet feeding. (A) Pecam1 mRNA levels in liver and skeletal of HF-fed Control (n = 5–6) and EC-FoxO1 KD (n = 6–7) mice. (B) Images of EDL muscle stained with Isolectin-FITC to identify capillaries (scale bar = 50 μm). (C) Capillary to fiber (C:F) ratios were calculated from 3 to 4 independent fields of view per mouse (Control n = 6, EC-FoxO1 KD n = 6). (D) Representative EM images of capillaries within skeletal muscle from HF-fed Control and EC-FoxO1 KD mice (×6.5k magnification; scale bar = 2 μm). (E–F) EC cross-sectional area (E) and capillary luminal diameter were quantified from EM images from n = 4 mice per group, with individual capillary measurements shown (F). Data in all panels are expressed as mean ± SEM; *p < 0.05, calculated with two-tailed unpaired t-test. The vasculature is critical for maintenance of adipose tissue homeostasis during obesity-driven adipocyte enlargement. Thus, we inferred that the increased vascular density observed with EC-FoxO1 depletion may hinder adipose tissue expansion and dysfunction induced by high-fat diet. Although HF-fed EC-FoxO1 KD mice showed only a trend towards reduced body weight gain (p = 0.06), these mice displayed less fat accumulation, showing lower trunk fat content, smaller retroperitoneal (rWAT) and subcutaneous fat pads compared to control mice (Figure 5A–C and Table 1). The phenotype was not explained by changes in food consumption (Figure 5—figure supplement 1A). 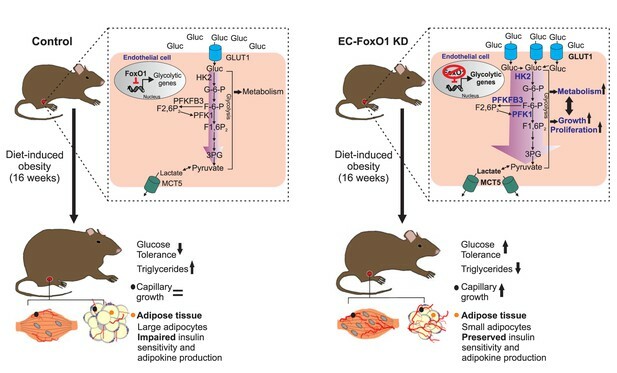 HF-fed EC-FoxO1 KD mice also displayed lower fed levels of serum triglycerides and glycerol, and less hepatic lipid accumulation (Figure 5—figure supplement 1B–D), suggesting an improvement in the capacity to handle dietary nutrient excess in these mice. Moreover, histological analysis revealed that increased vascular growth in adipose tissue of HF-fed EC-FoxO1 KD mice was associated with smaller-sized and generally spherical adipocytes, whereas adipocytes from HF-fed control mice were large with irregular polygonal shapes (Figure 5D–E), which was previously related to cellular stress (Giordano et al., 2013). Of note, adipocytes from EC-FoxO1 KD mice retained a unilocular structure (Figure 5D) rather than the hallmark multilocular morphology of brown fat. Furthermore, no change in the mRNA levels of browning markers Ucp1 and Prdm16 (Figure 5F) was detected with EC-FoxO1 depletion. Correspondingly, we did not observe any difference in mitochondrial protein content of eWAT nor in ADP-stimulated respiration through either Complex I (pyruvate/malate, glutamate) or Complex II (succinate) (Figure 5—figure supplement 2A–C). Isoproterenol-stimulated phosphorylation of the hormone-sensitive lipase (HSL) was unaffected (Figure 5—figure supplement 2D–E), indicating that EC-FoxO1 depletion did not impact the adipose tissue sensitivity to lipolytic stimuli. In contrast, and consistent with an improved function, eWAT from HF-fed EC-FoxO1 KD mice displayed enhanced Akt phosphorylation in response to insulin (Figure 5G–H), which was accompanied by higher Adiponectin mRNA levels and concomitant lower Leptin expression (Figure 5I). 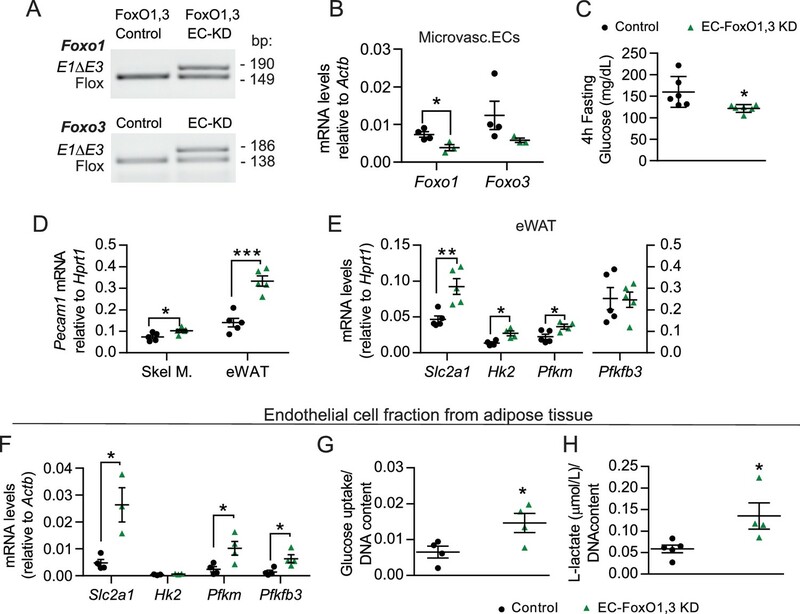 Collectively, these findings demonstrate that depletion of EC-FoxO1 signaling exerts a protective effect against obesity-induced metabolic remodeling of adipose tissue without promoting a browning phenotype. Notably, the transcripts levels of Vegfa and Apelin were also higher in eWAT from HF-fed EC-FoxO1 KD mice (Figure 5J), providing evidence that the improvements in adipose phenotype include a more pro-angiogenic adipose tissue microenvironment. 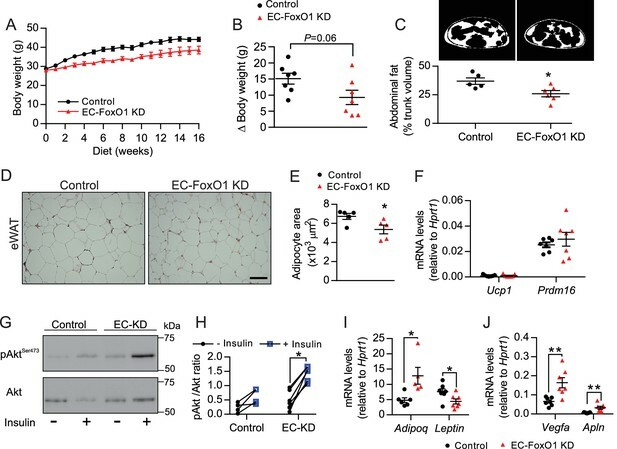 EC-FoxO1 KD mice exhibit a healthier adipose tissue expansion in response to HF diet. (A) Body weights during 16 weeks of HF feeding. (B) Summarized weight gain over the course of 0–14 weeks (Control n = 7, EC-FoxO1 KD n = 7). (C) Abdominal transverse micro-CT images of HF-fed Control (n = 5) and EC-FoxO1 KD (n = 6) mice (upper panel). Fat content (shown in white) was calculated as % of total trunk volume. (D) Representative hematoxylin and eosin-stained images of adipose tissue from the epididymal fat pad (scale bar = 100 μm). (E) Mean adipocyte cross-sectional area (Control n = 5 EC-FoxO1 KD n = 5). (F) mRNA for browning markers Ucp1 and Prdm16 relative to Hprt1 (Control n = 7, EC-FoxO1 KD n = 7). (G–H) Representative Western blot images (G) and quantitative analysis (H) of pSer473-Akt and total Akt levels in eWAT after ex vivo incubation in the absence or presence of insulin. Results are expressed relative to total Akt levels (Control n = 4, EC-FoxO1 KD n = 7). (I–J) mRNA for adipokines (I, Adipoq and Leptin) and angiogenic markers (J, Vegfa and Apln) in eWAT relative to Hprt1 (Control n = 6–7, EC-FoxO1 KD n = 5–7). Data in all panels are expressed as mean ± SEM; *p < 0.05, **p < 0.01, calculated with two-tailed unpaired t-test. To better understand the metabolic consequences of EC-FoxO1 depletion, whole-body metabolic functions were monitored for 48 hr in a 2nd cohort of HF-fed mice. Surprisingly, EC-FoxO1 KD mice exhibited reduced VO2 and increased RER during the dark cycle (Figure 6A,C) with equivalent CO2 production and activity levels compared to control mice (Figure 6B,D). These data unexpectedly indicated that EC-FoxO1 KD mice increased oxidation of carbohydrate relative to fatty acid as an energy substrate, suggesting that EC-FoxO1 depletion shifted whole-body energy homeostasis towards glucose oxidation. Consistent with these findings, HF-fed EC-FoxO1 KD mice displayed more rapid glucose clearance from the blood during glucose tolerance tests (Figure 6E–F). However, higher glucose tolerance was not associated with altered whole-body insulin sensitivity, based on insulin tolerance tests (ITT) (Figure 6G–H) or insulin-mediated Akt phosphorylation in the skeletal muscle (Figure 6—figure supplement 1). Despite the effects on glucose metabolism observed in HF-fed EC-FoxO1 KD mice, no change in whole-body glucose metabolism was detected in NC-fed EC-FoxO1 KD mice compared to control counterparts (Figure 6—figure supplements 1 and 2). Interestingly, fasting glycemia was significantly lower (Figure 6I) whereas serum lactate levels were elevated in HF-fed EC-FoxO1 KD mice compared to their littermates (10.9 ± 0.39 vs. 9.4 ± 0.55 mmol/L, respectively, p = 0.04, n = 7/group). These findings imply that altered whole-body glucose metabolism of EC-FoxO1 KD mice on a HF may be due to higher glucose turnover, leading us to postulate that increased glycolytic rates at the tissue level contribute to the metabolic phenotype of HF- EC-FoxO1 KD mice. To address this question, we first assessed the expression of main glycolytic genes, including the constitutive glucose transporter GLUT1 (Slc2a1), the rate-limiting enzymes hexokinase 2 (Hk2) and phosphofructokinase (Pfkm) and phosphofructokinase-2/fructose-2,6-bisphosphatase-3 (Pfkfb3). As anticipated, the mRNA levels of most glycolytic genes, with the exception of Pfkfb3, were upregulated in the eWAT from HF-fed EC-FoxO1 KD mice compared to control mice, (Figure 6J). Furthermore, mRNA levels of the lactate transporter, monocarboxylate transporter 5, Slc16a4, were also increased in eWAT of HF-fed EC-FoxO1 KD mice (Figure 6K), consistent with an increased glycolytic flux of glucose to lactate in the adipose tissue of these mice. EC-Foxo1 depletion improves glucose homeostasis in HF-fed mice. (A–D) O2 consumption (A), CO2 production (B), Respiratory exchange ratio - RER (C) and daily activity (D) were measured during indirect calorimetry tests using a comprehensive laboratory animal monitoring system (CLAMS, Control n = 5, EC-FoxO1 KD n = 6). (E) Glucose tolerance of HF-fed Control and EC-FoxO1 KD mice was examined by intraperitoneal glucose tolerance test after 15 weeks of HF diet and 16 hr fasting. (F) Area under the curve (AUC, Control n = 7, EC-FoxO1 KD n = 7). (G) Insulin sensitivity of HF-fed Control and EC-FoxO1 KD mice was assessed by intraperitoneal insulin tolerance test after 14 weeks of HF diet and 4 hr fasting. (H) Area over the curve (AOC, Control n = 14, EC-FoxO1 KD n = 16). (I) Plasma glucose levels of HF-fed Control (n = 14) and EC-FoxO1 KD (n = 16) mice after 4 hr fasting. (J–K) eWAT gene expression analysis by qPCR (Control n = 6–7, EC-FoxO1 KD n = 6). Data in all panels are expressed as mean ± SEM; *p < 0.05, **p < 0.01, ***p < 0.001, calculated with two-tailed unpaired t-test (F, I, J, K) or post hoc Bonferroni-corrected t-tests when a statistical significance was detected by two-way ANOVA model (A,C,D). EC rely dominantly on glycolysis to support angiogenesis (De Bock et al., 2013) and a previous study reported that FoxO1 overexpression represses EC metabolism (Wilhelm et al., 2016). Therefore, we hypothesized that the changes in glucose utilization were due, at least in part, to increased metabolic activity of EC resulting from EC-FoxO1 depletion. To explore this possibility, we isolated the EC fraction from white adipose tissue depots of mice fed a HF diet for 7 weeks and first assessed gene expression of main glycolytic pathway genes. Consistent with the findings observed with whole adipose tissue, increased mRNA levels of glycolytic genes Slc2a1, Pfkm and Pfkfb3 were detected in the EC fraction from adipose tissue of HF-fed EC-FoxO1 KD mice (Figure 7A–B). We also tested whether the elevated gene expression of glycolytic markers in EC from EC-FoxO1 KD mice would correspond with greater glycolytic capacity, as assessed by cellular glucose uptake and changes in glucose consumption and the accumulation of lactate. In agreement with higher transcript levels of Slc2a1, EC freshly isolated from adipose tissue of HF-fed EC-FoxO1 KD mice displayed increased glucose uptake than EC from floxed controls (Figure 7C). Moreover, rates of glucose consumption and lactate production were higher in EC with FoxO1 depletion compared to control cells (Figure 7D–E). Additionally, we observed elevated Mki67 mRNA in the EC fraction from EC-FoxO1 KD mice, indicating that an enhanced proliferative state coincides with the glycolytic activity of these EC (Figure 7F). FoxO1 is a critical regulator of glucose metabolism in EC. (A, B, F) Gene expression analysis of EC fraction from adipose tissue from Control (n = 3–6) and EC-FoxO1 KD (n = 4–5) mice fed a HF diet for 7 weeks. (C–E) Increased glucose uptake (C) glucose consumption (D) and lactate production (E) in EC fraction from HF-fed EC-FoxO1 KD (n = 4) mice compared to Control (n = 4–5). Data in all panels are expressed as mean ± SEM; *p < 0.05, **p < 0.01, calculated with two-tailed unpaired t-test (A,B,C,F) or post hoc Bonferroni-corrected t-tests when a statistical significance was detected by two-way ANOVA model (D,E). To corroborate that dysregulation of FoxO1 signaling is directly involved in disruption of glycolytic processes, we cultured skeletal muscle EC in low (5 mmol/L) and high glucose (25 mmol/L) conditions, as previous in vitro studies have shown that hyperglycemia can both increase FoxO1 activity (Tanaka et al., 2009) and stall EC metabolism (Du et al., 2000; Zhang et al., 2000; Du et al., 2003). As expected, high-glucose significantly increased FoxO1 protein levels in cultured EC (Figure 8A–B) and provoked changes in established FoxO1 target genes Cdkn1b (p27) and Ccnd1 (cyclin D1) (Figure 8—figure supplement 1A–B) that are involved in cell proliferation. 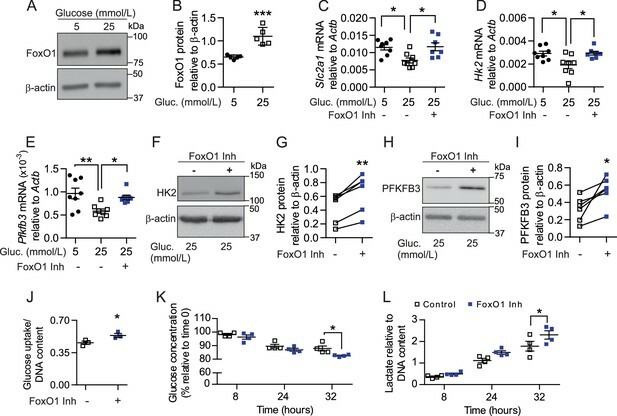 Consistent with increased FoxO1 levels and activity, high-glucose conditions also lowered the mRNA levels of glycolytic pathway components Slc2a1, Hk2, and Pfkfb3 (Figure 8C–E). Importantly, pharmacological inhibition of FoxO1 significantly reversed the high-glucose-induced reduction of each of these genes (Figure 8C–E), which correlated with elevated protein levels of HK2 and PFKFB3 (Figure 8F–I). Accordingly, treatment with FoxO1 inhibitor AS1842856 increased cellular glucose uptake and consumption in microvascular ECs, which corresponded with higher extracellular lactate levels (Figure 8J–L). Collectively, these findings indicate that lower FoxO1 levels and activity increase glycolytic and proliferative activities of EC. This induces a profound increase in glucose consumption by these cells, which consequently leads to higher glucose utilization at the tissue level, ultimately impacting whole-body glucose homeostasis. Pharmacological inhibition of FoxO1 in SMEC reproduces in vitro the endothelial phenotype observed with EC-Foxo1 depletion. (A–B) Representative Western blot images (A) and quantitative analysis (B) of FoxO1 and β-actin levels in primary EC from skeletal muscle cultivated under low (5 mmol/L) or high (25 mmol/L) glucose conditions for 48 hr (n = 5). Results are expressed relative to β-actin levels. (C–E) Transcript analysis by qPCR of microvascular EC from skeletal muscle cultivated under low (5 mmol/L, n = 8) or high (25 mmol/L, n = 8) glucose conditions for 48 hr in the presence or absence of the FoxO1 inhibitor (1 μmol/L AS1842856, n = 7) in the last 18 hr. (F–I) Representative Western blot images and quantitative analysis of hexokinase II (HK2, (F,G), PFKFB3 (H, I) and β-actin levels in primary EC from skeletal muscle cultivated under high glucose (25 mmol/L) conditions and treated with 1 μmol/L AS1842856 for 24 hr (n = 6). Results are expressed relative to β-actin levels. (J) Glucose uptake after 18 hr treatment with 1 μmol/L AS1842856 of microvascular EC from skeletal muscle cultivated under high glucose conditions (n = 3). (K–L) Glucose consumption (K) and Lactate production (L) were assessed in SMEC in the absence or presence of 1 μmol/L AS1842856. Cells were pretreated with 1 μmol/L AS1842856 for 24 hr (n = 4). Data in all panels are expressed as mean ± SEM; *p < 0.05, **p < 0.01, ***p < 0.001, calculated with two-tailed unpaired t-test (B,J), post hoc Bonferroni-corrected t-tests when a statistical significance was detected by two-way ANOVA model (C–E, K–L) or two-tailed paired t-test (G,I). FoxO1 and FoxO3 can demonstrate overlapping functions in EC (Potente et al., 2005) and previous studies reported that double depletion of Foxo1 and Foxo3 can either demonstrate similar effects as FoxO1 deficiency or have significant additive effects (Zhang et al., 2012; Haeusler et al., 2014). This led us to investigate whether double depletion of endothelial Foxo1 and Foxo3 would result in a greater angiogenic response in HF-fed mice. HF-fed EC-FoxO1,3 KD mice (generated using the tamoxifen-inducible, endothelial-specific Cre driver: Pdgfb-CreERT2) presented lower levels of fasting glucose (Figure 9A–C) and reduced adiposity, as evidenced by lighter subcutaneous and rWAT depots, compared to their littermate controls (Supplementary file 1). Similar to what was observed in EC-FoxO1 KD mice on a HF diet, increased expression of Pecam1 was detected in eWAT and skeletal muscle of HF-fed EC-FoxO1,3 KD mice (Figure 9D), indicating greater EC content in these tissues. Additionally, increased expression of glycolytic markers was observed in eWAT and EC fraction from adipose tissue of HF-fed EC-FoxO1,3 KD mice (Figure 9E–F). Consistent with these findings, increased glucose uptake (Figure 9G) and lactate production (Figure 9H) were also detected in the EC fraction from HF-fed EC-FoxO1,3 KD mice. Notably, these measurements demonstrated that combined depletion of EC-Foxo1 and Foxo3 elicits a similar, but not additive effect, when compared to EC-Foxo1 alone, indicating that FoxO1 is the dominant regulator of the EC response to HF diet. EC-Foxo1,3 depletion increases vascular growth and upregulates endothelial glycolytic processes comparable to EC-Foxo1 depletion. (A) PCR of genomic DNA from eWAT of Control (Foxo1,3f/f) and EC-FoxO1,3 KD mice using primers for the floxed and deleted alleles for each gene. (B) Foxo1 and Foxo3 mRNA levels in microvascular EC from white adipose tissue (Control n = 4, EC-FoxO1,3 KD n = 3). (C) Glucose levels after 14 weeks of HF feeding and 4 hr fasting (Control n = 6, EC-FoxO1,3 KD n = 6). (D) Endothelial cell marker Pecam1 mRNA level in skeletal muscle and eWAT of HF-fed Control and EC-FoxO1,3 KD mice (Control n = 5, EC-FoxO1,3 KD n = 5). (E–F) Gene expression analysis by qPCR of eWAT (E) and EC fraction from adipose tissue (F) of HF-fed Control (n = 3–5) and EC-FoxO1,3 KD (n = 3–5) mice. (G–H) Increased glucose uptake (G) and lactate production (H) in EC fraction from adipose tissue of EC-FoxO1,3 KD mice (n = 4) compared to Control counterparts (n = 4–5). Data in all panels are expressed as mean ± SEM; *p < 0.05, **p < 0.01, ***p < 0.001, calculated with two-tailed unpaired t-test. Herein, we provide evidence that endothelial FoxO1 is critical to the development of metabolic disorders in obesity through the converging actions of controlling metabolic activity and angiogenic fate of the endothelium. Our data underscore that the manipulation of endothelial FoxO1 levels profoundly modifies the endothelial phenotype under an obesogenic diet, with lower levels of EC-FoxO1 evoking increased endothelial metabolism and capillary growth, most robustly detected within visceral adipose. These effects were sufficient not only to prevent the detrimental obesity-driven alterations in visceral adipose tissue but also to elicit increased glucose clearance leading to higher glucose tolerance in HF-fed mice (Figure 10). Broadly, these findings provide support for the emerging concept that intrinsic metabolic properties of EC actively influence whole-body energy balance. Schematic depicting the influence of FoxO1 in controlling the response of ECs to a HF diet. In wild-type mice, FoxO1 represses glycolysis, which prevents endothelial cell growth. This results in impaired angiogenesis during adipose tissue expansion as well as dysfunction of the adipose tissue, which consequently leads to decreased glucose tolerance and increased serum and intra-tissue levels of triglycerides. Conversely, when FoxO1 is depleted in endothelial cells, up-regulation of glycolytic genes accelerates glycolysis, which supports increased cellular metabolism, growth and proliferation. This, in turn, increases the nutrient demand of endothelial cells, resulting in higher uptake and consumption of glucose and an increased production of lactate. The accelerated endothelial cell growth ultimately preserves adipose tissue functions and promotes improved systemic glucose tolerance and lipid metabolism. A marked increase in vascular density in the adipose tissue was the bona fide phenotypic consequence of EC-FoxO1 depletion, which was strikingly evident under the stress of obesity-related tissue expansion. This demonstrates that endothelial FoxO1 is a prime regulator of adipose tissue microvascular remodeling in adult mice, underlining our hypothesis that FoxO1 levels are directly implicated in limiting the angiogenic response of ECs in obesity. Despite the enlargement of capillaries that was observed in EC-FoxO1 KD mice, these mice displayed a healthier adipose phenotype that lacked the metabolic dysfunctions typically caused by obesity. This finding is in line with previous evidence suggesting that enhanced EC-FoxO1 activity is associated with reduced adipocyte insulin sensitivity in the adipose tissue of obese individuals (Karki et al., 2015). Therefore, our findings indicate not only that EC-FoxO1 depletion beneficially increases adipose vascular density but also emphasize the intimate interplay of EC and adipocytes and the crucial role of angiogenesis in the maintenance of adipose tissue functions (Corvera and Gealekman, 2014; Crewe et al., 2017). In contrast, EC-FoxO1 depletion induced relatively modest expansion of skeletal muscle vasculature. Our findings suggest that the tissue-restricted pattern of FoxO1-driven vascular growth is highly dependent on the co-presence of angiogenic factors within the local environment, which is impacted by nutritional status. Besides the higher levels of angiogenic mediators detected in adipose tissue of EC-FoxO1 KD mice, another argument favoring this hypothesis is provided by our observation that EC-FoxO1 depletion was associated with increased EC content within skeletal muscle only under HF feeding. It is noteworthy that previous reports showed that HF-feeding increases VEGF-A protein within the skeletal muscle (Silvennoinen et al., 2013; Nwadozi et al., 2016) and FoxO1 levels within skeletal muscle capillaries (Nwadozi et al., 2016). In this context, our findings also support the concept that the impaired vascular growth reported with sustained HF diet results from the repressive action of EC-FoxO1 (Milkiewicz et al., 2011; Roudier et al., 2013) rather than the lack of a pro-angiogenic stimulus. Interestingly, EC from HF-fed EC-FoxO1 KD mice demonstrated markedly enhanced glycolytic activity, based on the increased expression of glycolytic markers and concomitant increase in glucose uptake, glucose consumption and lactate production. Although the regulation of endothelial metabolism by Foxo1 overexpression was reported in cultured EC (Wilhelm et al., 2016), our data provide novel evidence of the impact of lower FoxO1 levels on endothelial metabolism and its consequences to whole-body homeostasis. It has become recently clear that endothelial metabolic activation represents an important feature of excessive angiogenesis, and that its repression holds therapeutic promise particularly within the tumor microenvironment (Schoors et al., 2014; Cantelmo et al., 2016). Our study drives this concept from the opposite angle by highlighting the potential for induction of endothelial metabolic activity as an approach to overcome the impairments in adaptive capillary growth that prevail in obese individuals. In fact, our data strongly indicate that the metabolic endothelial adaptation seen in response to FoxO1 depletion results in beneficial expansion of microvascular EC content and prevents obesity-related disorders. The lack of additional influence of combined depletion of EC Foxo1 and 3 with respect to expression of Pecam1 and glycolytic pathway genes and glucose uptake reinforces FoxO1 as the dominant regulator of EC metabolic homeostasis. More importantly, these findings indicate FoxO1 as a central target for the manipulation of capillary EC response to obesity-induced conditions. The finding that increased endothelial glycolysis induced by EC-FoxO1 depletion significantly impacts whole-body energy homeostasis is intriguing. Improvements in whole-body energy homeostasis subsequent to microvascular expansion have been observed previously (Sun et al., 2012; Nwadozi et al., 2016; Robciuc et al., 2016; An et al., 2017). Nonetheless, these effects had been ascribed to the improved passive exchange of oxygen, nutrients, and hormones to parenchymal tissues due to the increased capillary EC surface area. Our findings add another dimension to the provocative idea that EC can actively impact metabolism at the tissue level by bringing to light the dynamic contribution of EC metabolic activity to whole-body energy homeostasis during obesity. Although currently available tools do not provide the resolution required for a quantitative in vivo assessment of glucose consumption specifically by microvascular EC, our data strongly suggest that increasing EC metabolic activity leads to increased glucose uptake from the circulation and thus positively influences systemic glucose usage and tolerance. In addition, several pieces of available knowledge provide support for our hypothesis. First, EC are uniquely positioned at the interface between the bloodstream and the tissue parenchymal cells, which provides them with preferential access to circulating metabolic substrates. Second, glucose uptake by these cells is mediated via glucose transporter 1 (GLUT1), an insulin-independent transporter that is widely recognized to regulate basal glucose disposal. Interestingly, a direct connection between endothelial GLUT1 level and whole-organ glucose metabolism under physiological conditions was reported in a mouse model of EC-Hif1a depletion (Huang et al., 2012). Third, EC are among the most abundant cell types in the human body, accounting for 2–7% of the total cell number (Bianconi et al., 2013; Sender et al., 2016), with the majority of these EC residing within capillaries. Therefore, it is plausible that the combined increase in EC metabolic activity with the expansion of capillary EC number can impact the overall systemic glucose homeostasis. The exact contribution of EC metabolism to whole-body substrate utilization, however, merits further investigation, as EC-FoxO1 depletion reprogrammed both metabolic activity and angiogenic responses of EC. Beyond the remarkable effect that we observed on whole-body glucose metabolism, our findings support the notion that the substantial increase in vascular growth resulting from EC-FoxO1 depletion also impacted lipid handling under HF feeding conditions. In fact, HF-fed EC-FoxO1 KD mice displayed lower adiposity and serum levels of triglycerides and glycerol and less lipid accumulation in the liver. Although this could constitute a direct consequence of vascular growth, as fatty acid oxidation is used to support de novo nucleotide synthesis in EC (Schoors et al., 2015), it is also likely to involve secondary compensatory effects triggered by sustained imbalances in global glucose homeostasis that result from increased EC metabolic activity. A number of previous reports have shown that lower expression of EC-Foxo1 leads to disrupted vascular remodeling (Furuyama et al., 2004; Sengupta et al., 2012; Dharaneeswaran et al., 2014), which seemingly contradicts the phenotype we observed. A significant part of this discrepancy may arise from differences in experimental design and approach. Those studies used Cre-deleter models (Tie2-Cre and Cdh5-Cre) that broadly affect all vascular beds (including lymphatic endothelium) beginning at an early embryonic stage and also exhibit substantial Cre recombinase activity within hematopoietic lineages (Chen et al., 2009; Tang et al., 2010). In contrast, we employed a model of inducible EC-Foxo1 depletion in adult mice, in which Cre activity was restricted to mature microvascular EC. Consistent with our findings, the induced depletion of EC-Foxo1 in newborn mice resulted in increased EC growth and vessel enlargement within mouse retina (Wilhelm et al., 2016), although to a greater extent than the phenotype observed in our study. Interestingly, microvascular EC possess distinct tissue-specific molecular signatures (Nolan et al., 2013). In addition, it has been shown that EC-depletion of FoxO transcription factors can result in unique biological consequences in different tissue contexts (Paik et al., 2007). Thus, it is likely that both the developmental stage and the tissue microenvironment contribute substantially to phenotype observed with EC-Foxo1 depletion. These study-specific features emphasize that the methodological details need to be carefully considered in the interpretation of data from EC-Foxo1 depletion and highlight that the impact of EC-depletion cannot necessarily be extrapolated to different tissue contexts. Altogether, our study reveals that EC-FoxO1 depletion evokes increased glycolytic capacity of endothelial cells and enables microvascular expansion in conditions where an angiogenic stimulus is present, as exemplified by the capillary expansion seen in white adipose depots in HF-fed mice. The repercussions of these combined influences include profound improvements in white adipose tissue capacity to cope with the stimulus of sustained nutrient excess and systemic enhancement of glucose clearance. 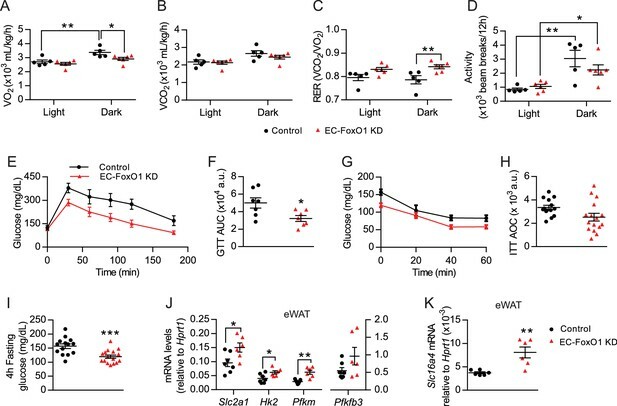 In conclusion, these effects clearly define FoxO1 as the major regulator of the EC response to HF diet through the repression of beneficial metabolic and angiogenic adaptations in response to the stimulus of nutrient excess. Finally, this study brings to light an unappreciated role of EC as a distinctive metabolic entity rather than a simple exchange interface and highlights the modulation of endothelial metabolic and angiogenic activity as a potential target in the treatment of obesity-related disturbances. Foxo1f/f mice and Foxo1,3f/f mice were derived from outbreeding of Foxo1,3,4f/f mice (Paik et al., 2007) with wild-type FVB/n mice, and genotyped to ensure homozygosity of the floxed allele(s). To permit the inducible endothelial-specific manipulation of Foxo1 and Foxo3a, these mice were bred with Pdgfb-iCreERT2 mice (C57Bl/6 background) (Claxton et al., 2008). Offspring were back-crossed with Foxo1f/f or Foxo1,3f/f founders for a minimum of 3 generations prior to experimentation to establish genotypes Cre-;Foxo1f/f and Cre+;Foxo1f/f or Cre-;Foxo1,3f/f and Cre+;Foxo1,3f/f, respectively. We performed five separate animal studies using only male mice. To generate mice with postnatal endothelial cell-specific deletion of FoxO1 (EC-FoxO1 KD), or double deletion of Foxo1 and Foxo3 (EC-FoxO1,3 KD), Cre-mediated recombination was induced in 4–6 weeks old Cre+;Foxo1f/f; mice and Cre+;Foxo1,3f/f; mice by five consecutive i.p. injections of 200 µL tamoxifen (15 mg/mL in corn oil). Recombination of Foxo1 (and Foxo3) alleles was confirmed via PCR analysis of genomic DNA (Paik et al., 2007). In all experiments, EC-FoxO1 KD and EC-FoxO1,3 KD mice were compared with age-matched tamoxifen-injected Cre-;Foxo1f/f or Cre-;Foxo1,3f/f littermates (referred to as Control). No statistical method was used to predetermine the sample size. At 6–8 weeks of age, male mice within each litter were assigned randomly, according to their genotypes, to either normal chow (NC, 11% kcal from fat) or high-fat (HF, 58% kcal from fat, Surwit Diet) groups. Water and diet were provided ad libitum. Body weights and food intake of mice included in studies 1 and 2 were recorded weekly. Specific animal groups and the tests conducted were as followed: Group 1: Control and EC-FoxO1 KD mice received 16 week NC or HF diets (n = 6–7/group) and underwent body composition imaging at week 13, GTT and ITT (weeks 14, 15 respectively) and tissue collection at week 16 for whole tissue analyses (histology and RNA). Based on the apparent lack of influence of Foxo1 deletion under NC diet in this group (see Results), subsequent testing focused on comparing the genotype differences observed in the HF condition: Group 2: Control and EC-FoxO1 KD mice (n = 7 and 8, respectively) underwent 14 week HF diet, metabolic testing (CLAMS) at week 13; ITT and tissue collection at week 14 for mitochondrial respiration, electron microscopy and serum analyses of TGs and glycerol. Group 3 and 4: Control and EC-FoxO1 KD mice (n = 5/group) and Group 5: Control and EC-FoxO1,3 KD (n = 6/group) underwent HF diet for 7, 5 and 14 weeks, respectively. Groups 3 and 5 were used to analyze 4 hr fasting glucose, and groups 3, 4 and 5 were used to isolate endothelial cell fractions from adipose depots for RNA and for glucose uptake, glucose consumption and lactate release assays. Animal studies were conducted in accordance with the American Physiological Society’s guiding principles in the Care and Use of Animals, following protocols approved by the York University Committee on Animal Care. Body composition was examined by micro-computed tomography (Skyscan 1278; Bruker) using the step and shoot function, averaging four images/frame with a rotation step of 0.75 degrees. Mice were scanned at a voltage of 50kV, a current of 200 A with a 0.5 aluminum filter while anesthetized with isoflurane. Images were reconstructed using NRecon (local) and the entire trunk area fat mass was analyzed using CTAn. Mice were monitored individually for oxygen consumption, carbon dioxide production, respiratory exchange ratio and locomotor activity using Indirect Calorimetry with the Columbus Comprehensive Lab Animal Monitoring System (CLAMS, Columbus Instruments, USA). Mice acclimated to CLAMS cages for 24 hr then data were recorded every 5 min for a 48 hr period. Mice had ad libitum access to food and water. VO2 and CO2 were normalized to body weight. Respiratory exchange ratio (RER) was calculated as the volume of CO2 relative to the volume of oxygen (VCO2/VO2). For ITT, Control and EC-FoxO1 KD mice were fasted for 4 hr and received an i.p. injection of insulin (0.75 U/kg BW). GTTs were conducted in overnight-fasted control and EC-FoxO1 KD mice using an i.p. injection of glucose (1.75 g/kg BW). Blood glucose was measured by glucometer (Freestyle Lite, Abbott Diabetes Care, ON, Canada) at post-injection time-points 0, 20, 40 and 60 min (ITT) or 0, 30, 60, 90 and 120 min (GTT). Insulin stimulation of skeletal muscle was conducted as described previously (Nwadozi et al., 2016) and the phosphorylation state of Akt was assessed by Western blotting. Epididymal fat pads were cut into ~ 80 mg pieces and pre-incubated with low glucose DMEM containing 1% fatty acid-free BSA for 30 min (37°C) before 30 min incubation with insulin (25 mU/mL) or isoproterenol (10 µmol/L). Tissue explants were snap frozen in liquid nitrogen and the phosphorylation states of Akt or HSL were assessed by Western blotting. Respirometry studies in freshly extracted epididymal white adipose tissue (eWAT) were performed using high-resolution respirometry (Oroboros Oxygraph-2k, Oroboros Instruments, Crop, Innsbruck, Austria). EWAT fat pads were prepared as done previously (MacPherson et al., 2016), minced in MIR05 buffer, weighed and immediately placed in separate Oroboros Oxygraph-2k in respiration media (MIR05) containing 20 mmol/L creatine (Saks et al., 1995). State three respiration was stimulated with the addition of ADP [5 mmol/L] in the presence of pyruvate [5 mmol/L] and malate [4 mmol/L] followed by glutamate [10 mmol/L] and succinate [20 mmol/L]. Respiration experiments were completed at 37°C before the oxygraph chamber reached 150 mmol/L [O2]. Mitochondrial membrane integrity was tested with the addition of 10 mmol/L cytochrome c oxidase at the end of each protocol. Total protein extraction from isolated cells or tissues was performed as previously described (Milkiewicz et al., 2011). Primary antibodies were as follows: FoxO1, Ser473-pAkt, Akt, Ser563-pHSL, HSL, HK2, PFKFB3, α/β-tubulin, β-actin and Mitoprofile Total OXPHOS Cocktail. Secondary antibodies were goat anti-rabbit or anti-mouse IgG-horseradish peroxidase. Membranes were developed using enhanced chemiluminescence and densitometry analysis was performed with ImageJ Analysis Software (NIH). For microvascular quantification, pieces of eWAT were fixed in 4% formaldehyde and stained with BODIPY 493/503 (0.25 µg/mL) and rhodamine-Griffonia Simplicifolia lectin (1:100) to visualize adipocytes and microvessels, respectively. Images were taken with a Zeiss LSM700 confocal microscope (10x or 20x objectives) using identical gain settings for all samples. Microvascular content and branchpoint numbers were quantified from 3 to 4 10x fields of view per animal, and vessel diameters from 20x images, using Image J Analysis Software (NIH). For morphometric analysis of adipocytes, eWAT was fixed in 4% formaldehyde. Paraffin embedding, sectioning and hematoxylin and eosin staining were carried out by The Centre for Phenogenomics (Toronto, Canada). Adipocyte area was analyzed in three randomly selected fields of view (4x objective) using ImageJ Analysis Software (NIH). For quantification of capillaries, de-paraffinized sections were stained with fluorescein isothiocyanate-conjugated Griffonia Simplicifolia Lectin-1 (1:100) and Rhodamine Wheat Germ Agglutinin (1:200). Images were acquired using a 10X objective on a Zeiss inverted microscope equipped with a digital cooled CCD camera, capturing 3–4 independent fields of view per mouse. Image J software was used to quantify the numbers of capillaries and adipocytes in corresponding Griffonia and Wheat Germ Agluttinin-stained images, respectively. Cross-sections of EDL were stained with Griffonia simplificolia-FITC for assessment of capillary to fiber ratio (Nwadozi et al., 2016). Pieces of EDL muscles from HF-fed Control and EC-FoxO1 KD mice (n = 4/group) were fixed in 2% glutaraldehyde and 4% paraformaldehyde in 0.1M phosphate buffer (pH = 7.4) and sent for EM processing at the Hospital for Sick Children (Toronto, Canada). Cross-sectional images of capillaries (identified by lack of smooth muscle cell coverage) were captured by a blinded EM technician. Luminal diameters and endothelial cross-sectional areas of all detected capillaries within each sample were assessed using Image J software. Serum triglycerides and glycerol levels were measured using commercial kits. Triglycerides were also measured in homogenates of liver and gastrocnemius muscle. Lactate levels were assessed in serum from HF-fed Control and EC-FoxO1 KD mice and in phenol-free cell culture medium of adipose-derived endothelial cells and SMEC also using a commercial kit. SMEC were isolated from collagenase digested skeletal muscle using rat anti-mouse VE-cadherin antibody-coated Dynabeads and biotinylated rat anti-mouse CD31 antibody-coated streptavidin-coupled beads, cultivated as described previously (Roudier et al., 2013), and used in experiments between passages 4 and 7. For glucose and FoxO1 inhibitor treatments, cells were plated and after overnight attachment, culture medium was replaced by low (5 mmol/L) or high-glucose (25 mmol/L) DMEM 10% FBS and incubated for 48 hr and 1 µmol/L AS1842856 was added to the medium 18 hr prior to testing. To examine the influence of FoxO1 inhibition on protein levels of glycolytic enzymes, SMEC were plated sparsely. After overnight attachment, culture medium (high-glucose DMEM with 10% FBS) was replaced by high-glucose DMEM with 0.1% FBS and the cells were stimulated with 1 µmol/L AS1842856 for 24 hr before lysis in RIPA buffer for protein extraction. For the isolation of adipose-derived endothelial cells, white adipose depots were pooled and digested with 0.5% Type I collagenase for 20 min at (37°C) with shaking. Centrifugation (300xg for 5 min) was used to separate adipocytes from the stromal vascular fraction (SVF). The re-suspended SVF was passed through a 100 μm-cell strainer, then pre-incubated with rat anti-mouse CD16/CD32 coupled to Dynabeads to deplete immune cells. Endothelial cells were selected using rat anti-mouse VE-cadherin antibody-coated Dynabeads and biotinylated rat anti-mouse CD31 antibody-coated streptavidin-coupled beads. Cells were plated on gelatin-coated plates and maintained in high-glucose DMEM (10% FBS) until utilization the following day. Glucose uptake was assessed in freshly adipose-derived endothelial cells and in SMEC using Glucose Uptake-Glo Assay following manufacturer’s instructions. To examine the effects of Foxo1 depletion on the glycolytic capacity of endothelial cells, freshly isolated adipose-derived endothelial cells were incubated with high-glucose DMEM plus 10% dialyzed FBS for 32 hr. The effects of FoxO1 inhibition were examined in SMEC pre-treated with 1 µmol/L AS1842856 for 24 hr in high-glucose DMEM plus 0.1% FBS following incubation with high-glucose DMEM plus 10% dialyzed FBS for 32 hr. Glucose consumption and lactate production were determined in cell culture medium at different time points (0, 8 and 24 hr) using commercial kits. Total RNA was isolated from liver, skeletal muscle (plantaris), adipose tissue (BAT, eWAT and subcutaneous), adipose-derived endothelial cell and CD16/CD32 fractions and SMEC using RNeasy Mini Kit (Qiagen Inc.), reverse-transcribed and analyzed by real-time PCR on the Rotor-Gene Q platform (Qiagen Inc.) using Fast TaqMan Master Mix and TaqMan primer sets (listed in Supplementary file 2). Each target gene was calculated relative to Hprt1 or Actb levels and expressed as 2-ΔCt. All data reported are for independent biological replicates; each mouse being considered as one biological replicate. Averaged values were used when technical replicates (analysis of the same sample in duplicates) were performed. For in vitro assays, experiments were repeated at least three times and a sample size of ≥ 3 biological replicates was used. Samples or data points were excluded only in the case of a technical equipment or human error that caused a sample to be poorly controlled. Statistical analyses were performed using Prism 5 (GraphPad Software Inc.). Significance was established at p < 0.05, by unpaired Student’s t-test or 2-way ANOVA with Bonferroni post hoc tests, as appropriate. Data are shown as means ± SEM and P values are indicated in each Figure as *p < 0.05, **p < 0.01, ***p < 0.001. Biochimica et Biophysica Acta (BBA) - Molecular Basis of Disease 1842:463–472. Journal of Clinical Investigation 127:74–82. Journal of Clinical Investigation 112:1049–1057. Journal of Biological Chemistry 279:34741–34749. Journal of Lipid Research 54:2423–2436. Arteriosclerosis, Thrombosis, and Vascular Biology 35:1498–1506. American Journal of Physiology-Cell Physiology 311:C269–C276. The American Journal of Pathology 178:935–944. Annual Review of Medicine 56:45–62. Journal of Clinical Investigation 115:2382–2392. Journal of Molecular and Cellular Cardiology 27:625–645. The Journal of Experimental Medicine 215:611–626. Journal of Biological Chemistry 275:40042–40047. Thank you for submitting your article "Endothelial-specific Foxo1 depletion prevents obesity-related disorders by increasing vascular metabolism and growth" for consideration by eLife. Your article has been reviewed by two peer reviewers, and the evaluation has been overseen by a Reviewing Editor and Mark McCarthy as the Senior Editor. The reviewers have opted to remain anonymous. This manuscript by Rudnicki and colleagues studies the impact of endothelial cell (EC)-specific depletion of FoxO1 on high-fat diet induced obesity. By utilizing a tamoxifen-inducible EC-specific Foxo1 knock-out mouse model, the authors demonstrate that upon high-fat diet, EC Foxo1 elimination results in greater vascular growth in visceral white adipose tissue and healthier adipose tissue expansion, resulting in improved glucose intolerance. The authors suggested that the mechanism for metabolic improvements is increased endothelial glycolytic capacity and enhanced endothelial proliferation. Overall, the present work provides novel insights into the role of endothelial FoxO1 on controlling vascular growth under diet induced obese conditions, particularly in adipose tissues. e) The work done by Wilhelm K, et al., 2016, utilized the exact same mouse model as the authors have employed (Pdgfb-creERT2/Foxo1 flox/flox) to demonstrate that EC loss of Foxo1 caused hyperplastic vasculature but resulted in the inability of ECs to extend proper sprouts and uncoordinated vascular growth. Considering many of these previously published articles are not supporting the findings in the present manuscript, the authors should carefully evaluate their own results and extensively discuss possible reasons for the inconsistency. 2) More functional evidence other than merely gene expression data is required to support the conclusion that EC depletion of Foxo1 promotes endothelial glycolytic capacity, such as utilizing measurements of glycolytic rates on a Seahorse. 3) The authors state that EC-Foxo1 depletion stimulates vascular growth during age-related adipose expansion (Figure 1) but no data are shown concerning the age-related adipose expansion (for example increased visceral adipose tissue mass normalized to body weight from week 0 to week 16 for each genetic background) and depletion of foxo1 is shown only at mRNA level. Similarly, all data are originated from direct comparison between two different genetic backgrounds (floxed mice are derived from outbreeding of Foxo1, 3, 4ff mice with wild-type FVB/n mice, described to be resistant to high fat diet-induced obesity, and the genetic background of Pdgfb-creERT2 mice is not indicated) under high fat diet. Comparisons between diets (normal chow and high fat) in the same genetic backgrounds (including body weights, fat depot and muscle weights as well as metabolic parameters) will be more relevant. 4) The lower adipocyte size described in Figure 4 may explain the greater microvascular content in Figure 2. The microvascular content must be expressed as capillary:adipocyte ratio as performed for muscle (Figure 3). We respectfully disagree with the statement that we have misinterpreted several important previous papers on Foxo1 depletion and endothelial cell function. We initially did not discuss findings from these papers for the sake of focus and brevity. However, we agree with the reviewers that the manuscript will benefit from added discussion of these points, which is included in the revised version of our manuscript. Importantly, we highlight a unifying emergent theme – that the influence of endothelial FoxO1 varies with context [developmental stage; tissue type; vessel type; presence of environmental stressors], and that these variations are unmasked through the use of a variety of experimental models and methodological approaches. We elaborate on this below. Stage of development at the time of FoxO1 deletion in endothelial cells (EC) significantly influences outcomes:Whilst embryonic deletion of EC-Foxo1 (or global FoxO1) leads to lethality with apparent disruption of vascular organization (not EC differentiation),1-3 post-natal conditional deletion of EC-FoxO1 is not lethal.4 These contrasting phenotypes (lethal vs. not lethal) observed with the genetic manipulation of FoxO1 in EC reflect the disparate incidence of angiogenesis in pre- vs. postnatal life and are also consistent with differences in the process of embryonic/developmental angiogenesis compared to angiogenesis within adult tissues. Throughout embryogenesis, the entire organism undergoes active expansion, and all vasculature (macro and micro) likewise is stimulated to expand, remodel and specialize according to location in the vascular tree. In turn, at the adult stage, angiogenesis occurs only when stimulated, and only within selective locations of the vasculature. Since endothelial cells (EC) are considered to be quiescent in the adult, angiogenic growth is orchestrated by a selected subset of mature EC, which do not exhibit the functional plasticity observed in embryonic EC. Moreover, recent data suggest that capillary formation and expansion in the adult occurs by clonal expansion of mature endothelial cells5 whereas random integration or cell mixing mediates developmental angiogenesis. All these differences ultimately impact how the vasculature expands at different stages. Importantly, the effects on cell morphology and sprouting and the poor responsiveness to VEGF and TGFβ in response to FoxO1 deletion reported by Furuyama et al.1 and Matsukawa et al.6 were observed with the use of embryonic stem cells, which exhibit some but not all characteristics of mature differentiated endothelial cells. These data were challenged by findings published by Paik et al.,7 who demonstrated that the deletion of FoxO transcription factors in EC of adult mice can either increase their proliferative capacity enhancing the response to VEGF or show no detectable phenotypic alteration. Thus, while findings reported with embryonic stem cells provide some clue of the effects of FoxO1 in EC, caution should be applied in extrapolating these results to the phenotype of mature EC. Furthermore, the differential processes involved in neovascularization within embryonic and adult vasculature offer a plausible rationale for the distinct phenotypes observed with FoxO1 deletion and limit the extent of direct comparison that can be made between the two types of experimental models. The tissue microenvironment is crucial in establishing the consequence of EC-FoxO1 deletion: It has been reported that organ-specific differences remarkably affect phenotypic features of EC when depletion of EC-FoxO transcription factors is induced in adult mice,7 which is consistent with the current knowledge that microvascular EC show distinct molecular signatures within different tissues according to unique extravascular and intrinsic signals.8 Thus, the microenvironment exerts substantial control over angiogenesis,9 and tissues exhibit a range of angiogenic capacities at the adult stage. For example, in the absence of an added metabolic stimulus, skeletal muscle microvasculature in adult mice is very stable and angiogenic signals are minimal. Conversely, adipose tissue undergoes expansion through-out maturity as adipose depot size increases with age, and it produces a multitude of pro-angiogenic factors that help to coordinate capillary growth with tissue expansion. In this context and in agreement with the previous cited study,7 data from our current paper (and prior study,10 despite use of a different FoxO deletion strategy) provide strong evidence that these tissue environments affect the outcome of EC–Foxo1 deletion. Indeed, while EC-Foxo1 deletion exerted minimal phenotypic effects within skeletal muscle of normal chow-fed mice, increased vascular density was detectable in white adipose tissue of the same mice. In considering the study of Wilhelm et al.,4 it is apparent that we observed some similar and some disparate phenotypic features of EC with Foxo1 depletion. Of note, although the authors had used a similar inducible deletion model, they induced the deletion of Foxo1 in newborn mice and assessed the effects of endothelial-specific depletion of Foxo1 specifically in retinal developmental angiogenesis. Consistent with their findings, we also observed more vessels and larger vessels in the adipose tissue vasculature when the deletion of Foxo1 was induced in adult male mice. However, the more extensive disorganization of the vasculature observed by Wilhelm et al. but not in our study may be interpreted as the consequence of stronger stimulation of the EC by the potently pro-angiogenic environment within the maturing retina. Considering that those investigators closely tracked angiogenic processes within a narrow time window (i.e. 14-21 days) while we reported end-point vascular differences after 16 weeks of diet intervention, we cannot rule out the occurrence of alterations in endothelial cell sprouting/migration in our model. Our study was not designed to have the temporal resolution to assess those events, but it would be valuable to address this question in future investigations. Differences between Cre deleter models used to elicit FoxO1 depletion: Importantly, the selection of Cre mouse model can lead to divergent phenotypes directly affecting the outcomes of EC-Foxo1 depletion. Tie2-Cre and Cdh5-cre models used in Dharaneeswaran et al.3 and Tanaka et al.11 studies are widely employed to manipulate gene expression within the endothelium. However, both models show substantial Cre recombinase activity within hematopoietic lineages,12-14 which can confound the analysis and interpretation of the resultant phenotype. In addition, as both promoters are active in all endothelial cell populations, these constitutively active endothelial Cre transgenic models, affect all vascular beds, including lymphatic vasculature15, 16 beginning at an early embryonic stage being thus generally referred to as endothelial-specific knockout models. It is worth noting that in direct contradiction with previous studies,1, 2 Tanaka et al11 reported no lethality with embryonic EC-Foxo1 deletion and as the reviewers also highlighted their EC-specific Foxo1 knockout mice “were born at term in Mendelian ratios and showed no gross or metabolic abnormalities.” Strikingly, additional studies2, 3 that also used the Tie2-cre deleter to target Foxo1 reported embryonic lethality at approximately E11.0. The discrepancies between these studies and the Tanaka et al. study can probably be attributed to the variable cre activity associated with this Cre model. Indeed, Heffner et al. demonstrated that “embryos from the same litter display very different levels of Cre excision, ranging from endothelial-specific to nearly ubiquitous in non-target tissues.”14 In contrast with these previous studies, we did not use a constitutively active endothelial Cre transgenic model. Instead, the endothelial Cre/ERT2 model used in our study induces Cre recombinase activity at the adult stage (by nature of the timing of the tamoxifen-injection) under the control of the Platelet-derived growth factor B (Pdgfb) promoter.17Pdgfb expression is observed in capillary endothelial cells and in the endothelium of growing arteries during embryonic development and is restricted to capillaries into the adult stages.18 Therefore, the activation of Pdgfb-driven Cre recombinase activity at the adult stage favours the influence of genetic manipulation within capillaries not affecting all EC equally. As a consequence, the divergent pattern of Cre activity between our model and the Tie2 or Cadh5-deleter models3, 11 also could contribute to the differences in phenotype observed by us compared to those studies. Overall, through these examples, we hope to have made a case that a) we do have a strong awareness of preceding studies and how their results relate to our own investigation and b) differences in the methodological approaches/experimental models need to be carefully considered in the interpretation of data from EC-Foxo1 depletion when comparing the findings of these previously published articles and our data. Finally, we also would like to emphasize that ours is the first report documenting the effect of EC-Foxo1 depletion in adult male mice, uniquely assessing angiogenesis of adipose tissue and skeletal muscle in the context of obesity. Overall, our study brings to light several novel concepts in vascular remodeling of these tissues in a pathophysiological context, which is relevant for understanding disease processes in the adult. While our answer to the reviewers has been extensive to justify our position, we have inserted a much briefer mention of these issues into the Discussion of the manuscript (seventh paragraph), as we share the reviewers’ point of view that it is beneficial to readers for us to explain differences in models. We have now added to the revised manuscript a new set of data to illustrate that EC-Foxo1 depletion, as well as the inhibition of FoxO1 transcriptional activity, leads to increased glycolytic capacity of endothelial cells. For this experiment, we isolated microvascular endothelial cells from adipose tissue of adult male mice with EC-Foxo1 depletion (EC-FoxO1 KD) fed a high-fat diet (HF) for 5 weeks. Due to the limited yield of cells obtained, we were not able to assess the glycolytic capacity of those cells measuring the extracellular acidification rate of cell medium by Seahorse analysis as suggested by the reviewers. As a surrogate approach to provide a functional read-out, we conducted matched measurements of glucose consumption and lactate production over time by measuring the lowering of glucose and the accumulation of lactate in the media over a 32 hour time window. In line with the data we provided before on fluorescent glucose uptake and lactate release, endothelial cells freshly isolated from adipose tissue of high fat-fed EC-FoxO1 KDmice displayed higher rates of glucose consumption than cells from floxed littermate controls. These findings were paralleled with increased lactate levels in the cell culture medium. These data argue in favor of increased glycolysis, the predominant bioenergetic pathway for ECs.19 To complement these observations, we repeated the measurement of lactate levels of microvascular endothelial cells from skeletal muscle cultivated in high-glucose conditions treated with FoxO1 inhibitor (AS1842856) with several protocol modifications. In the originally submitted manuscript, lactate levels were measured in cell medium after endothelial cells were incubated with FoxO1 inhibitor for only 18 hours in high-glucose medium containing 10% FBS. This time, we pre-incubated the cells for 24 hours with FoxO1 inhibitor in high-glucose medium with 0.1% FBS for 24 hours. After this 24h-pretreatment, culture medium was replaced by high-glucose DMEM plus 10% dialyzed FBS and cells were incubated in the presence and absence of FoxO1 inhibitor for 32 hours and cell media was collected in different time points (0, 8, 24 and 32 hours) for the assessment of glucose and lactate levels. Consistent with the findings in endothelial cells with EC-FoxO1 KD, we detected increased rates of glucose consumption and lactate productions when FoxO1 transcriptional activity was inhibited. Finally, we analyzed cultured microvascular EC treated with FoxO1 inhibitor for 24 hours for protein levels of hexokinase 2 and PFKFB3, and observed an increase in protein that matched with their elevated gene expression. We have added these new data to the revised manuscript (Figure 7D-E, Figure 8F-I, and Figure 8K-L). With respect to age-related adipose expansion: We thank for the reviewers for this observation. Because we did not conduct analyses of adipose depots at week 0 of the diet, we realize that we cannot directly comment on age-related adipose expansion. We have adjusted the wording in the Results and Discussion accordingly. With respect to FoxO1 depletion: We have added Western blots of capillaries segments freshly isolated from skeletal muscle of EC-FoxO1 KD mice and Control littermates to provide further evidence of the efficacy of FoxO1 deletion at the protein level. Protein level decreased by ~ 70%, indicating that the decrease in FoxO1 mRNA is representative of a loss of FoxO1 protein (Figure 1D). With respect to mouse background: We realize that our description of the mouse strains was not sufficiently detailed, leading to misinterpretation. Foxo1fl/flmice are on an FVB background. The Pdgfb-iCreERT2 founder is on a C57BL/6 background. After cross-breeding these two mouse strains, subsequent generations were bred back to the Foxo1fl/fl strain to obtain homozygosity for the floxed alleles. Litters were back-crossed to the Foxo1fl/fl founder line for 3 generations prior to beginning experiments. It also is important to note that all experiments were conducted on littermates, sharing the identical genetic background. Littermate mice homozygous for the floxed Foxo1 or Foxo1,3 alleles but not expressing Cre recombinase were used as controls in our study. In our revised manuscript we have better described these details about the mice used in our study both in the Results and the Materials and methods section. We understand the reviewers’ concern and agree that the adipocyte size could confound the assessment of microvascular density within adipose tissue. To address this question, we have quantified capillary number in paraffinized sections of eWAT from HF-fed Control and EC-FoxO1 KDmice (same experimental group used in the whole-mount staining analyses). The obtained data further confirm our previous findings of increased vascular density in adipose tissue of HF-fed EC-FoxO1 KD mice and clearly showed that the phenotype described in the originally submitted manuscript is not secondary to smaller adipocyte size. These data have been included in the revised manuscript (Figure 3F-G). 1) Furuyama T, Kitayama K, Shimoda Y, Ogawa M, Sone K, Yoshida-Araki K, Hisatsune H, Nishikawa S, Nakayama K, Nakayama K, Ikeda K, Motoyama N, Mori N. Abnormal angiogenesis in Foxo1 (Fkhr)-deficient mice. Journal of Biological Chemistry 2004 August 13;279(33):34741-9. 2) Sengupta A, Chakraborty S, Paik J, Yutzey KE, Evans-Anderson HJ. FoxO1 is required in endothelial but not myocardial cell lineages during cardiovascular development. Developmental Dynamics 2012 April;241(4):803-13. 3) Dharaneeswaran H, Abid MR, Yuan L, Dupuis D, Beeler D, Spokes KC, Janes L, Sciuto T, Kang PM, Jaminet SS, Dvorak A, Grant MA, Regan ER, Aird WC. FOXO1-mediated activation of Akt plays a critical role in vascular homeostasis. Circ Res 2014 July 7;115(2):238-51. 4) Wilhelm K, Happel K, Eelen G, Schoors S, Oellerich MF, Lim R, Zimmermann B, Aspalter IM, Franco CA, Boettger T, Braun T, Fruttiger M, Rajewsky K, Keller C, Bruning JC, Gerhardt H, Carmeliet P, Potente M. FOXO1 couples metabolic activity and growth state in the vascular endothelium. Nature 2016 January 14;529(7585):216-20. 5) Manavski Y, Lucas T, Glaser SF, Dorsheimer L, Gunther S, Braun T, Rieger MA, Zeiher AM, Boon RA, Dimmeler S. Clonal Expansion of Endothelial Cells Contributes to Ischemia-Induced Neovascularization. Circ Res 2018 March 2;122(5):670-7. 6) Matsukawa M, Sakamoto H, Kawasuji M, Furuyama T, Ogawa M. Different roles of Foxo1 and Foxo3 in the control of endothelial cell morphology. Genes Cells 2009 October;14(10):1167-81. 7) Paik JH, Kollipara R, Chu G, Ji H, Xiao Y, Ding Z, Miao L, Tothova Z, Horner JW, Carrasco DR, Jiang S, Gilliland DG, Chin L, Wong WH, Castrillon DH, DePinho RA. FoxOs are lineage-restricted redundant tumor suppressors and regulate endothelial cell homeostasis. Cell 2007 January 26;128(2):309-23. 8) Nolan DJ, Ginsberg M, Israely E, Palikuqi B, Poulos MG, James D, Ding BS, Schachterle W, Liu Y, Rosenwaks Z, Butler JM, Xiang J, Rafii A, Shido K, Rabbany SY, Elemento O, Rafii S. Molecular signatures of tissue-specific microvascular endothelial cell heterogeneity in organ maintenance and regeneration. Dev Cell 2013 July 29;26(2):204-19. 9) Augustin HG, Koh GY. Organotypic vasculature: From descriptive heterogeneity to functional pathophysiology. Science 2017 August 25;357(6353). 10) Nwadozi E, Roudier E, Rullman E, Tharmalingam S, Liu HY, Gustafsson T, Haas TL. Endothelial FoxO proteins impair insulin sensitivity and restrain muscle angiogenesis in response to a high-fat diet. FASEB Journal 2016 September;30(9):3039-52. 11) Tanaka J, Qiang L, Banks AS, Welch CL, Matsumoto M, Kitamura T, Ido-Kitamura Y, DePinho RA, Accili D. Foxo1 links hyperglycemia to LDL oxidation and endothelial nitric oxide synthase dysfunction in vascular endothelial cells. Diabetes 2009 October;58(10):2344-54. 12) Chen MJ, Yokomizo T, Zeigler BM, Dzierzak E, Speck NA. Runx1 is required for the endothelial to haematopoietic cell transition but not thereafter. Nature 2009 February 12;457(7231):887-91. 13) Tang Y, Harrington A, Yang X, Friesel RE, Liaw L. The contribution of the Tie2+ lineage to primitive and definitive hematopoietic cells. Genesis 2010 September;48(9):563-7. 14) Heffner CS, Herbert PC, Babiuk RP, Sharma Y, Rockwood SF, Donahue LR, Eppig JT, Murray SA. Supporting conditional mouse mutagenesis with a comprehensive cre characterization resource. Nat Commun 2012;3:1218. 15) Alva JA, Zovein AC, Monvoisin A, Murphy T, Salazar A, Harvey NL, Carmeliet P, Iruela-Arispe ML. VE-Cadherin-Cre-recombinase transgenic mouse: a tool for lineage analysis and gene deletion in endothelial cells. Dev Dyn 2006 March;235(3):759-67. 16) Srinivasan RS, Dillard ME, Lagutin OV, Lin FJ, Tsai S, Tsai MJ, Samokhvalov IM, Oliver G. Lineage tracing demonstrates the venous origin of the mammalian lymphatic vasculature. Genes Dev 2007 October 1;21(19):2422-32. 17) Claxton S, Kostourou V, Jadeja S, Chambon P, Hodivala-Dilke K, Fruttiger M. Efficient, inducible Cre-recombinase activation in vascular endothelium. Genesis 2008 February;46(2):74-80. 18) Hellstrom M, Kalen M, Lindahl P, Abramsson A, Betsholtz C. Role of PDGF-B and PDGFR-β in recruitment of vascular smooth muscle cells and pericytes during embryonic blood vessel formation in the mouse. Development 1999 June;126(14):3047-55. 19) De Bock K, Georgiadou M, Schoors S, Kuchnio A, Wong BW, Cantelmo AR, Quaegebeur A, Ghesquiere B, Cauwenberghs S, Eelen G, Phng LK, Betz I, Tembuyser B, Brepoels K, Welti J, Geudens I, Segura I, Cruys B, Bifari F, Decimo I, Blanco R, Wyns S, Vangindertael J, Rocha S, Collins RT, Munck S, Daelemans D, Imamura H, Devlieger R, Rider M, Van Veldhoven PP, Schuit F, Bartrons R, Hofkens J, Fraisl P, Telang S, Deberardinis RJ, Schoonjans L, Vinckier S, Chesney J, Gerhardt H, Dewerchin M, Carmeliet P. Role of PFKFB3-driven glycolysis in vessel sprouting. Cell 2013 August 1;154(3):651-63. We thank T Gustafsson (Karolinska Institutet) for critical reading of the manuscript and valuable discussions. This work was funded by Canadian Institutes of Health Research Grant MOP-130491 (to TLH and ER) and Natural Science and Engineering Research Council of Canada (Discovery Grant #436138–2013 to CGRP). The funders had no role in study design, data collection and interpretation, or the decision to submit the work for publication. Animal experimentation: All animal studies were conducted in strict accordance with the American Physiological Society's guiding principles in the Care and Use of Animals, following protocols approved by the York University Committee on Animal Care (reference number: 2017-19 R3). © 2018, Rudnicki et al.